MATCH REVIEW: Grundfos Tatabanya KC win their first European cup group phase match ever against another group phase debutant, Maccabi CASTRO Tel Aviv. 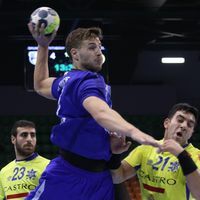 Grundfos Tatabanya KC celebrated their first group phase win in history when they opened the Men’s EHF Cup 2016/17 Group Phase versus Maccabi CASTRO Tel Aviv, who are the first Israeli team ever in this stage of European cup competition, on Wednesday night. The match was equal most of the way, but Tatabanya managed to take a decisive lead in the last 10 minutes. The home team also had the initiative most of the first half, as they went from 3:3 to 6:3 and kept the three-goal lead for the rest of the period. After the break, it did not take Tel Aviv – led by Pomeranz’s lethal shots – long to catch up, and for the following 15 minutes the game was equal with the lead changing hands. Tatabanya decided the matter in the last 10 minutes when they took a lead of four goals – a gap that was impossible for the visitors to close.